I wish everyone the happiest holiday season. 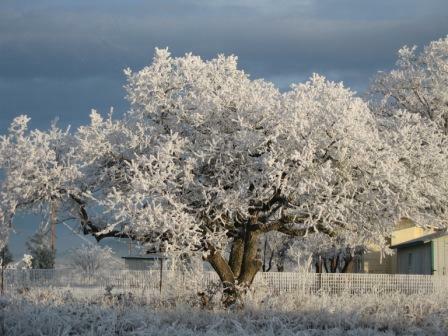 Here's a pic of one of our trees this morning. It's cold!!! No what you see is NOT snow, it is freezing fog. It's been like this for 3 days straight now. The thing is we are not used to this here in the Rogue Valley. It's quite unusual for us to have cold weather like this. But is sure is pretty. Too bad there is no heat in the warehouse. I just got back from 2 fun-filled days in Las Vegas at the "EK Extravaganza". This is an event put on by EK Success where we take classes making projects, learn about the new products they have coming out, place our orders and generally have some fun. December: a new lightbox called the Merry Glo-Round (I think that's the name, LOL), which is a lightbox that rotates so you can move your work to more easily see what you are doing without have to reposition everything. Price is $49.99. I'll have more details on my website within the next few days. For January, they are introducing new punches. Four of them are pop-up punches (paw print, teddy bear, present, and rose..... two more punches are the Retro Flower in a medium size and a medium size support ribbon (punch it out of any color to coordinate with the cause). Also in January, we are looking at many many new stickers including Phrase Café epoxies, metal signs, lots of new beautiful Jolee's, great papers in bright colors, a line of cap & gown dimensional embellishments including tassels in many school colors, and the cutest baby gift packs consisting of a newborn size jumper that baby can wear for real packed with a miniature size matching replica so you can scrap baby's picture with the matching embellishment! In March, EK is releasing some GREAT new tools. I am really excited about the March release. We got to try a few of the new tools and also were able to see others demoed. First is the Cutterfly, which basically looks like a Swiss army knife, but instead of "manly tools", it folds out to unveil scissors, a paper piercing tool, tiny tweezers, a file for distressing, etc. Next is the Circle Scissors Plus, which is used to both DRAW and CUT circles of any size. The tool is very easy to use. It has a blade which adjusts with a screw type mechanism so you control the exact size of your circle. Or, you can replace the blade with a unit that holds ANY pen/pencil/marker like a drill holds a drill bit, and you can draw circles. A neat idea is to draw a circle with a marker, then cut your circle slightly bigger for a faux matting effect without the bulk. But that's not all, they also have a cute little tool called the Piercing bug. This is SOOO fun. Comes as a set of both piercing bugs. One has a wheel that makes a single row of holes, and the other is a double row. The holes are tiny, just big enough for doing paper embroidery or placing a brad. So you can simply make a line of evenly spaced holes by rolling the tool along your paper, then you can stitch using the holes and your stitching will be straight. What, you want more? OK, also in March, the most exiting tool I have seen in years: The 1-2-3-D Paper Crafter. OMG, this is neat!!! It's a set of templates/mats to create basically any size/shape of box you can imagine. It will come with an instruction booklet AND a DVD. Some of the boxes they had on display were made from old greeting cards, pictures, calander pages, and of course patterned paper. The boxes ranged from your normal square and rectangles (in many sizes, totally adjustable) to mini purses, a "shoe" box (shaped like a shoe), pillow boxes, reverse pillow boxes, octagon boxes, and cards that open to pop-up paper cutting. The possibilities with this tool are endless, and the price point is great at only $39.99. I think this will be a must have tool for every paper crafter. Of course, in March we will also be seeing more new papers, more new stickers, and some wonderful chipboard coin albums, gift bags and boxes, and more.